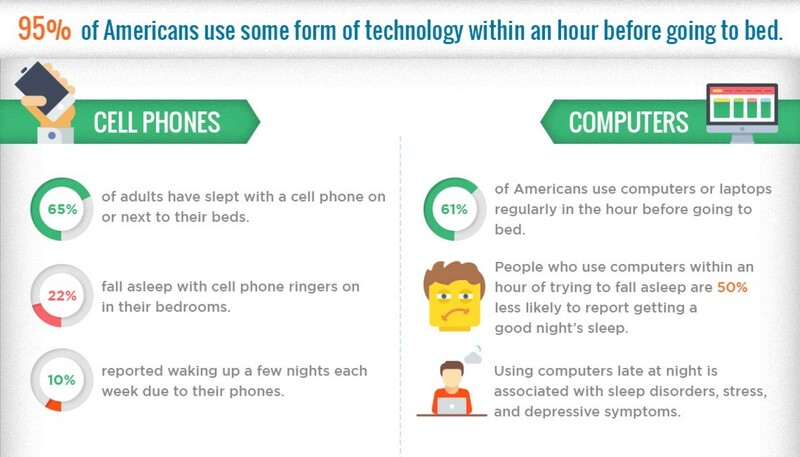 In this infographic, we’ll take a look at how technology impacts sleep as well as some tips that will help you put away your electronics and establish healthier sleeping habits. Research shows that 65% of adults have slept with a cell phone on or next to their beds, while 61% use computers or laptops regularly in the hour before going to sleep. 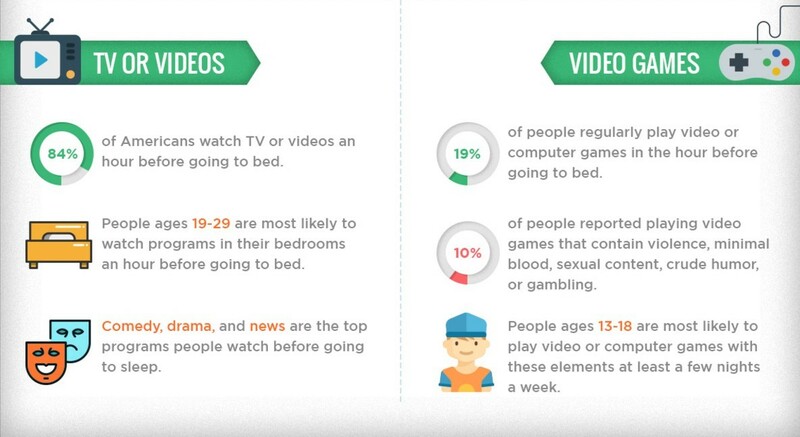 Additionally, an overwhelming 84% of Americans watch TV or videos within an hour before going to bed, and 19% play video or computer games an hour before hitting the hay. On top of all that, late night technology use is associated with sleep disorders, stress, and depressive symptoms, and people who use computers within the hour before trying to fall asleep are 50% less likely to report getting a good night’s sleep. Are younger generations more sleep deprived? 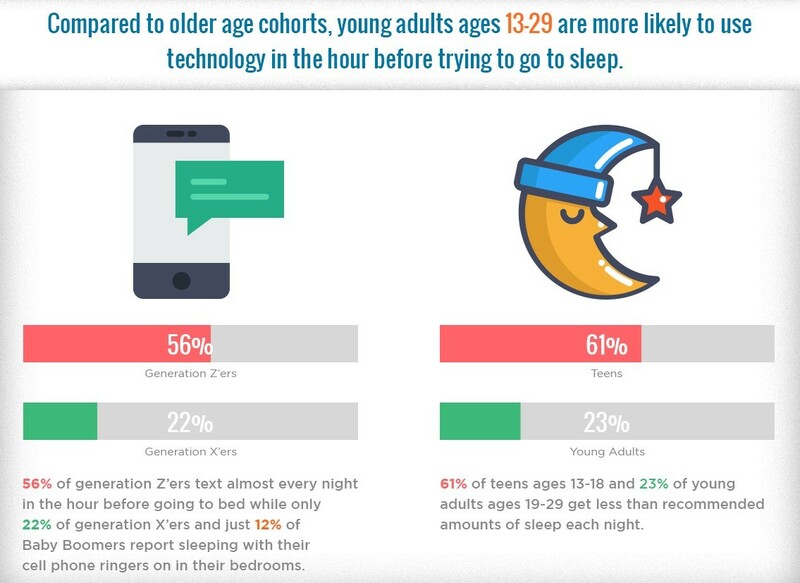 Compared to older generations, teens and young adults ages 13-29 are more likely to use technology before trying to fall asleep. And 61% of teens ages 13-18 get less than the recommended amounts of sleep each night. Younger generations are also more likely to text in the hour before going to bed, while only 22% of generation X’ers and just 12% of Baby Boomers report falling asleep with their cell phone ringers on in their bedrooms. Why do electronics keep you awake? Electronics can make it hard for you to unwind at night because the blue light emitted by their screens inhibits the production of melatonin, the hormone that controls your circadian rhythm. 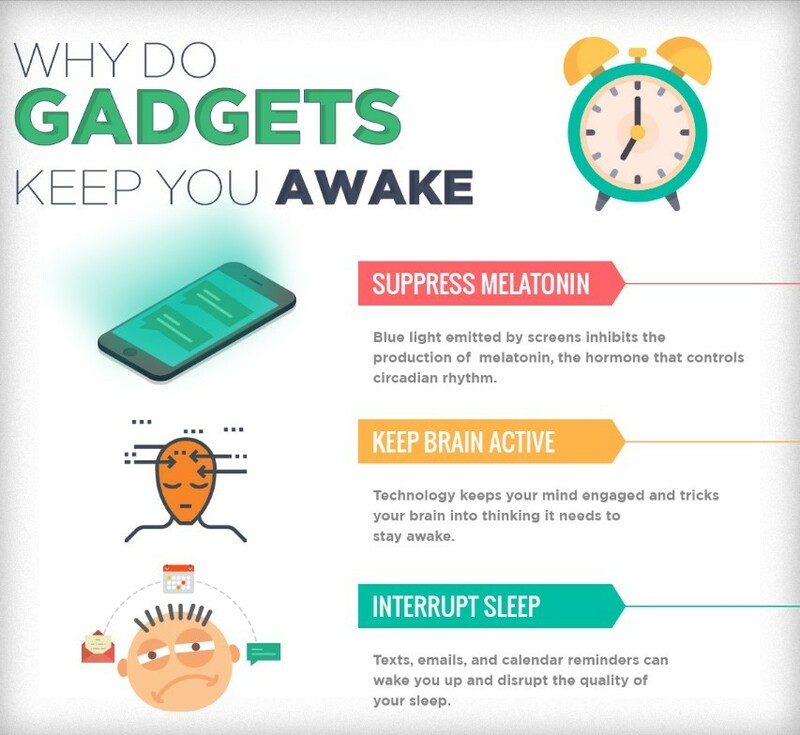 In addition, gadgets keep your mind active and trick your brain into thinking it needs to stay awake. And even when you finally do fall asleep, texts, emails, and calendar reminders can wake you up and prevent you from getting quality sleep. Do you have a hard time falling asleep, wake up during the night, or wake up feeling unrefreshed? If you struggle with sleeping problems, you’re not alone. 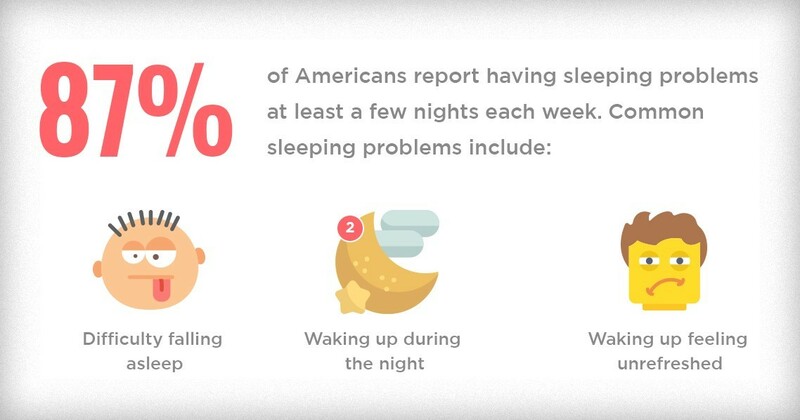 A whopping 87% of Americans report having sleeping problems a few nights each week. And lack of sleep can lead to serious health problems, such as heart disease, high blood pressure, stroke, and diabetes. 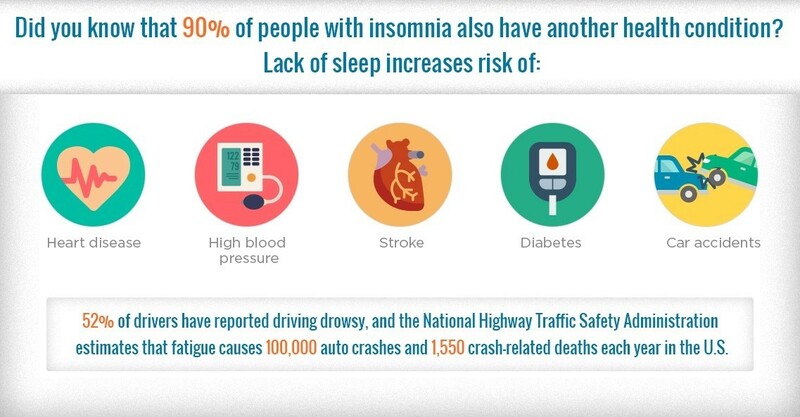 According to the National Highway Safety Administration, fatigue is also the cause of 100,000 auto crashes and 1,550 crash-related deaths in the U.S. each year. In an effort to cope with lack of sleep, more people are turning to caffeine, and 74% of Americans consume an average of one caffeinated beverage each weekday. Napping is also a growing trend with 44% of people curling up for some extra shut eye during weekdays or weekends. 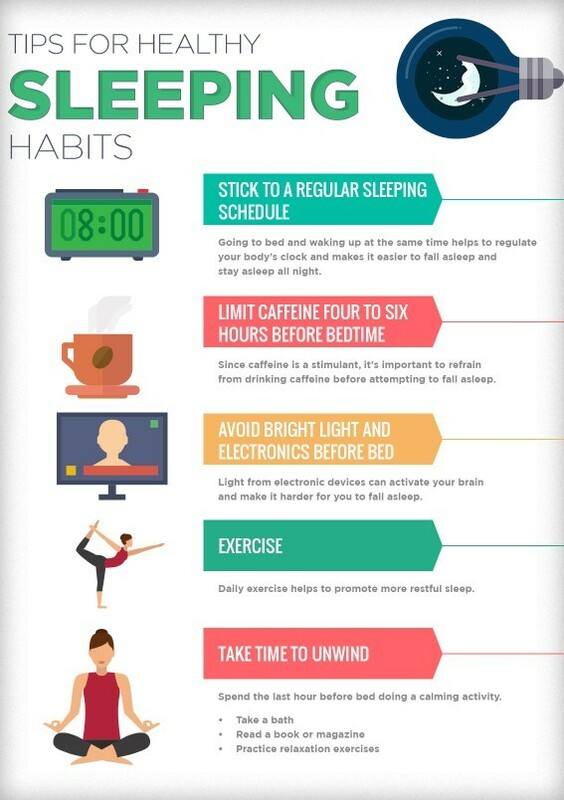 Want to establish healthy sleeping habits? If you want to fall asleep faster and get a better night’s sleep, it’s time to put away your cell phone and close your laptop before you decide to go to sleep. Check out these tips to help you establish healthy sleeping habits and wake up feeling refreshed and ready to take on the day… with or without coffee in hand. Know someone who has trouble unplugging at night? Tired of seeing your best friend walking around like a zombie? Share this infographic with them, and post it on social media! And comment below with other tips and tricks for turning off the electronics to promote healthier sleeping habits. I’d love to hear from you!